It's April now! And we're definitely getting the April showers today, though snow is also in the forecast this week. One last blow and then spring weather? We shall see! I'm okay with spring, I just don't like summer. Heat is not my friend. Some of you are shaking your heads right now, I can sense it. Look, I grew up in the hot, humid south. I had my fill of heat! Now, I don't mind it if I'm poolside or on a beach. Send me on a hot vacation and I'll gladly accept the heat. Or take me on a cold climate vacation and I'll take that too. You know what...anything and everything is better when the word "vacation" is thrown in the mix. Wait, where was I going with this and how does it lead to my March faves? Forgive me. I've had two cups of coffee in the recent hours and my brain is in overdrive. Back to this blog post topic. 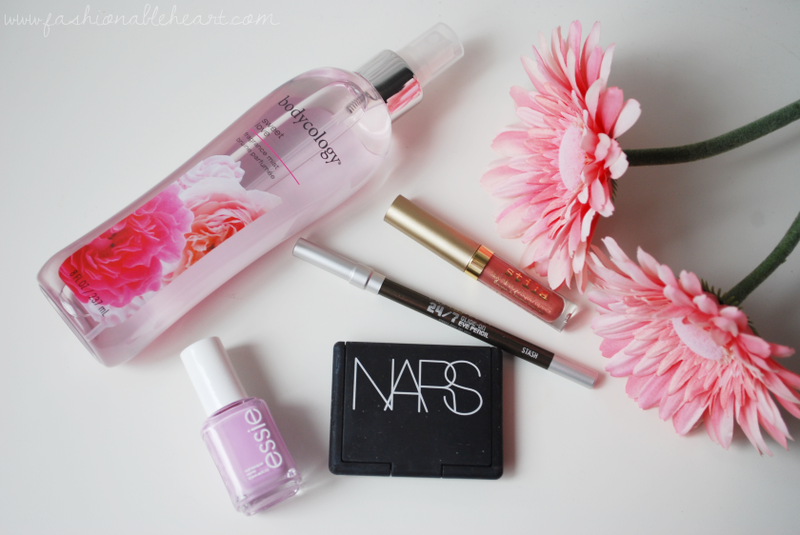 Here's what I have been loving recently! There's been one dud I tried this month and I've been thinking of doing a blog post on it. If not a blog post, stay tuned to my Instagram because I do want to talk about what I experienced while trying the product. 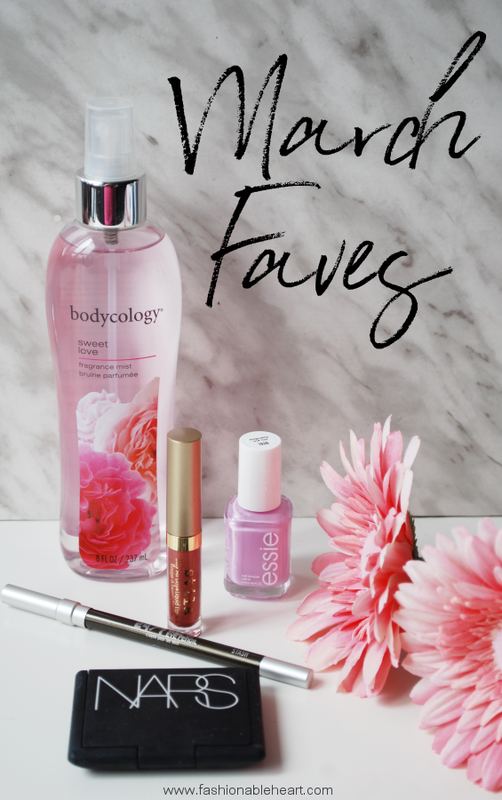 Bodycology Sweet Love Fragrance Mist - I love this scent from the moment it is sprayed to when it starts to fade. Not an overwhelming floral scent at all. Stila Splendore Shimmer - I think this color might have been LE to the set I got, but that's not the total point of this being a fave. The formula is A+. Essie Baguette Me Not - A beautiful pastel purple that works so perfectly for spring! Urban Decay 24/7 in Stash - I brought Stash out around St. Patrick's Day because it is my favorite green liner, but I had forgotten just how amazing it is and have kept it in my daily rotation lately. NARS Bellissima Eyeshadow Duo - I love pulling out this duo because it is effortless for daily use.